Sometimes, a home’s great room might not be living up to its name. Yes, it’s large in scale, but is it providing the comfort and function you want? 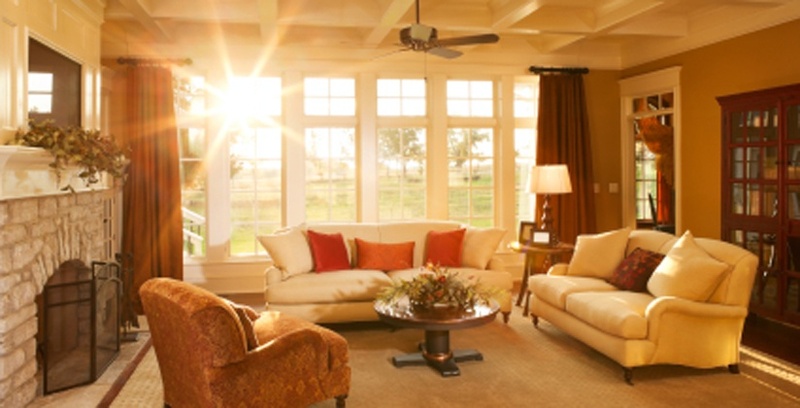 Maybe it’s time rethink your great room, and focus on how to make it even greater. A great room is usually a multi-functional space, combining a family room and living room, with maybe even some dining and study options. It’s often connected to the kitchen, to make access to food quick and easy. 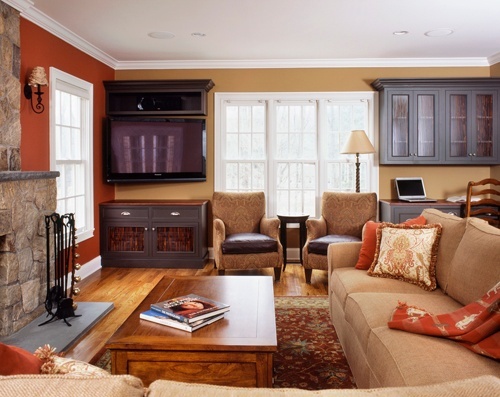 As your home’s “Jack-of-all-trades”, the great room can become an undefined repository of everything that doesn’t already have its own place. You have a conversation and television viewing area, a nook for reading, and maybe a play space for the kids. But does it just feel like you’ve filled the space without stepping back and thinking objectively how this big area functions—or should? Many clients come to us with a similar complaint, “My house just isn’t working for me.” Before we can deliver the right solution, we try to zoom in on the source of the problem and it’s usually because we’re living by the 21st century culture in a 20th century (or earlier) home. We use our home spaces differently now than when they were built decades ago. Cooking, dining, entertainment, and play look very different now. The rumpus room of the 50s has become a high-tech entertainment space. The small kitchens that were built into older homes have been expanded to allow for more appliances, gadgetry, and more involved culinary exploits. Homeowners are looking for more open floor plans, so the interior layout of an older home might really not be a good fit. However, with a little creativity and a good team, it could be. We usually start a remodel by looking at the space to see how it flows. It’s important to be clear about the uses you want for this room. Do you need distinct areas, like a place to read or study? Will you be entertaining often? Does your family congregate in the great room for game night, tv viewing, hobbies, or casual dining? What are some of the common complaints about the room (e.g., it’s too dark, too open, too cluttered, too far from the fridge)? Next, don’t feel confined to the current layout of your great room. Walls can be built or knocked down to create the space you need. If your kitchen is closed off from the great room, open it up. A pass-through or island can connect these two important spaces, so that whoever is cooking up something in the kitchen can feel like part of the activity happening in the great room. Half walls with columns can provide division without closing off a part of the room, and they add a beautiful accent. Turn a plain doorway into an archway or add corbels for an interesting accent. You can also reduce clutter by adding storage spaces to the room, like built-in bookcases and cabinets. Incorporate wall niches or other dimensional wall alterations to bring more shape to the room, instead of entirely flat walls. Many great rooms feature a fireplace, but it might not be the attractive focal point it could be. 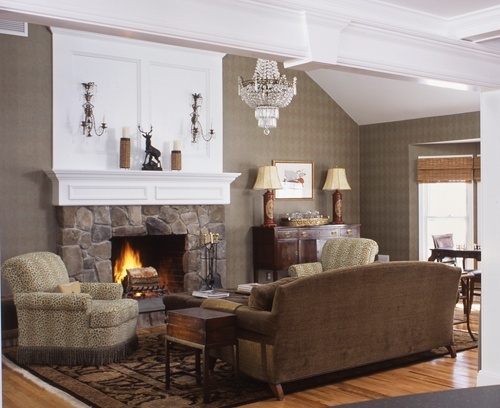 Maybe your great room makeover should start with redoing the hearth or fireplace surround. 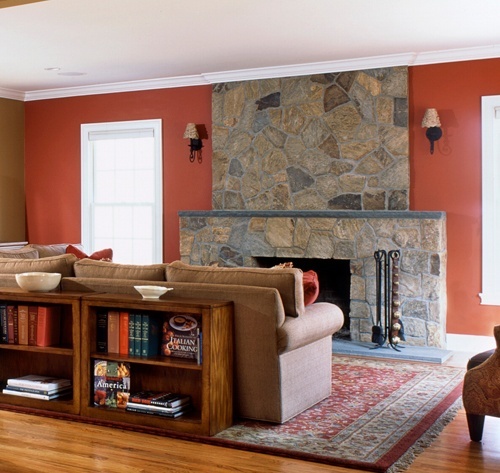 Tile, fieldstone, slate, or marble can revive a tired fireplace. With so many choices today, you can find a material and color that will work with your chosen décor. Or we can furnish a beautiful mantelpiece with decorative trim to accent your fireplace. Also think about switching to gas logs, instead of a fireplace insert, so you can keep the traditional look of a fireplace without the mess or cleaning up logs and ashes. Of course, changing the flooring, wall colors and treatments, and lighting can go a long way toward improving your great room. Retire your track lights and opt for sconces, pendants, and other more interesting fixtures. Add dimmers to every switch to control the mood lighting. Trade your carpeting for hardwood and area rugs that give you more decorating flexibility. Change the door and window trim. Paint one wall in a different color (or wallpaper) for accent.